Robert Baxt has created a charming, heartwarming script and routine for the classic Professor's Nightmare which explores sibling rivalry but, in the end, teaches the importance and power of love of family. This is just the type of routine that we like to have on AmazeKids because it combines family values like no other trick we've seen before. So why is the trick called "Naughty & Nice"? Because Baxt is a full time working pro. He's developed a variety of approaches depending upon the needs of the audience. 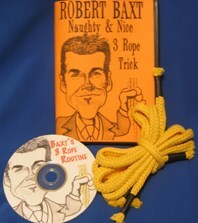 The DVD includes 3 completely different scripts for his handling of the ropes. 1) his "Nice" routine, a charming and heartwarming version perfect for all FAMILY shows that will tug at the heartstrings. 2) You get his "Naughty" routine which is more adult. However, it is not risqué or rude. It's a routine to music with rhyming patter that takes the trick where no one else has dared to go! 3) Finally, you'll also receive Robert's very commercial corporate and trade show presentation for the trick that he has done hundreds of times for Fortune 500 companies and in trade show booths across the nation. With the DVD you get a set of ropes so you can get started right away. However if you're outside the U.S., and have magician's rope, we recommend that you get the DVD only to save money on the shipping cost. You can order by clicking on the recommended product below. This is as close to 'the perfect trick' as you can get. It packs small, plays big, requires no reset and is always ready to go. It fits in your pocket and plays everywhere! But Robert's script really takes it to the next level. You get detailed instructions on the DVD with a custom size set of white ropes similar to the ones Robert uses in the video. Get Naughty and Nice (we prefer the "Nice") and you'll always be ready to amaze kids (and their families)!